motocross trophy girls and trophie babes you just cant ignore. Dirt bike females dishing out the silver-wear. Motocross trophy girls are evident in most dirtbike races. They might be handing out the prizes or are there perhaps as part of a sponsorship partner. These motocross chicks add a bit of glamour and glitz to any event. So many events are held up and down the country, so you’re sure to see them at a local track you go to. Supercross is of course the most viewed type of racing and they embrace the glamour of a spandex lady with a smokin’ award. You see them at multitudes of sports events, including motocross events. They are the girls who lure buyers to the stands or tents to talk to vendors or company representatives hawking a certain product, such as oil, sunglasses, graphics, energy drinks and beer. Beautiful and elegant women, they have top of the line clothing, perfect makeup and if there is a hair out of place, you can be sure it was designed to look that way. Fill in the sport you are thinking of, but for now, recognize them as the motocross trophy girls. Instinctively fans wonder what special items the motocross trophy girls are promoting, be it tires, jerseys or MX boots. Most will wander over to find out and often discover they can get an autographed picture of the girls or, in some cases, a picture of themselves with the girls. It is only polite to purchase something while you are there. Whenever you look at that picture or share it with friends, you are going to think of the product represented with a good feeling. So besides a paycheck and the opportunity to look doggoned good, what is in it for the girls? Motocross trophy girls have several benefits, two of which is free travel to events and a quick bask in the roar of the crowd when the silverware is handed out on the MX podium. One of the secrets of motocross trophy girls is that many are the fans who come to the tracks (which is good for the career and the ego) plus - they enjoy seeing the events without paying admission too. Another not so secret benefit is seeing the motocross guys competing against one another and looking good - well, at least until they start to race and get dirty. Sometimes the girl has to ride on the back of the bike for advertising reasons. This is NOT a tough task at all, if it happens to be her favorite rider. With its popularity, motocross might lead to a better gig. Meanwhile, life is good – and a gal needs to be in the public eye to sell those calendars and pin-up pictures. If you’re going along to a jr peewee motocross race or mini pitbike tracks that amateurs can go along to for a day of fun – be sure to support the female riders and the trophy girls (should they be around). Often local models will have been asked to attend (if the crowds of a sizeable proportion). It’s a great way to round off a local event by having the glamour of some ladies handing out the silverware. If you get the chance grab an autograph or pic – they might become famous one day, and you can dine out on that for years to come. Motocross trophy girls are there to enjoy the day too - and additions of glamour are very welcome on a windswept n’ muddy day. Whatever or wherever you are in the world pop along and support your local track or club. Spring Creek MX Park is the hub of a lot of action for Millville motocross fans. The Millville, Minnesota track is the home circuit for Ryan Dungey. A featured race like Round 7 of the 2011 AMA Motocross Championship brings the top names in MX action, including Dungey, Ryan Villopoto and Chad Reed (with an incredible crash), as well as Trey Canard who rode his first 450 motocross there in July 2011 resulting in a podium appearance. Trees and grass cover the area around the winding track. It has been a MX track since 1976 and gained AMA races in 1982. Featured events include the Lucas Oil AMA Pro MX Championship, Loretta Lynn's AMA Amateur National Regional and Qualifiers, and the amateur event Donny Schmitt Memorial Race, held the day before the nationals on the pro track. 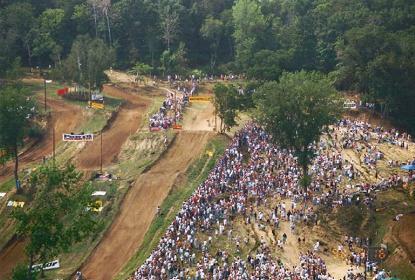 Millville motocross draws great crowds and free parking area and open-air seating add to the appeal. Air-Conditioning keeps the VIP suites and incredible concession stand cool. Permanent restrooms, onsite camping and a shaded picnic area enhance the family friendliness. Reserve an RV spot or stay at one of the many hotels in the area. 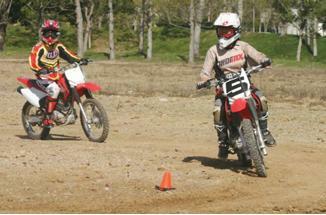 Participate in family friendly motocross events while vacationing in Minnesota. Also we had to leave you with this awesome Chad Reed crash, - and when you look at the recovery he has at Millville – we think he deserves not only his own TROPHY! – but a kiss from a trophy girl too.